"A cup of bike ?" - "With 2 Mirra please." 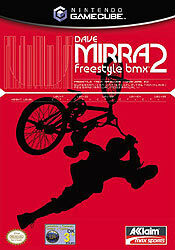 I didn't really like extreme sport games before trying Dave Mirra 2, now I'm not addicted but I'm far more interested. Where Activision/Treyarch failed to convince me, Acclaim/Z-Axis succeeded. Though it's an old game now, with primitive 128 bits graphics, it remains quite fun and very challenging. There are many things to do in the 10 big levels of the game, you can even fully edit your own. Some of the challenges are very tough and sometimes the control tends to be very annoying, but beyond that, you can enjoy yourself all the way. You can perform tons of different tricks and combos thanks to a linking system. The only thing that is really lacking to Dave Mirra 2 is a personality, it's a bit lifeless like most extreme sport games. You have your 3 minutes task to do, a few boring persons to talk to and that's it. Aggressive Inline has much more to offer in this area. Yep, Aggressive Inline is Z-Axis' great successor to Dave Mirra 2, but it's worth to try this one too. It must be easy to get it cheap by now, you should give a try, you'll definitely not feel like you've been wasting your money. 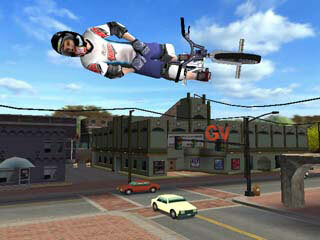 "- The only game that features 10 time world champion and 11 time X-Games champion, Dave Mirra. 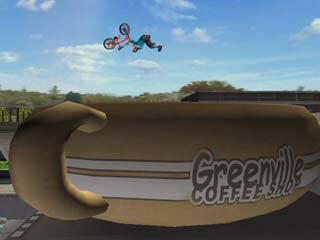 - State of the art Park Editor lets you create your own BMX experience. - A roster of 14 BMX pros exclusively including Dave Mirra, Ryan Nyquist, and Rick Moliterno. - 8 massive levels, 4x bigger than before, for the very best in vert, dirt, street and park riding and all of Camp Woodward. - Innovative S.I.K. trick system with the new grind, wall ride, manual and lip trick modifiers, lets you pull over 1500+ tricks. - 10 super-competitive multiplayer games. - Compete to earn more than 40 real-life BMX sponsors during your ProQuest experience. - Killer soundtrack featuring: Ozzy Osbourne, The Cult, Methods of Mayhem and Godsmack." An eight? Are you serious? This game wasn't anything special at all. Even the prequel for the PS1 was way better than this title. If you rated this game an eight, you must've not played one Tony Hawk game in your life. Or at least the prequel on PS1. I played the PS2 version way back when this game cost $50. I was horribly disappointed. 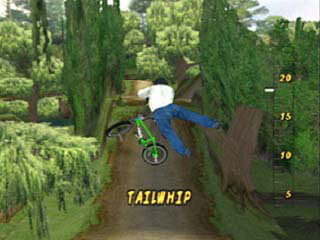 After being a HUGE fan of the original Dave Mirra on PS1, DM2 really lets you down. The mechanics are completley thrown out the window, and the whole feel for the game is pretty much gone. I believe they took away helmets in the final version of the game, and for some reason...that really bothered me. Well anyway I give the game a (3.5)4(4.7) out of 10.